Star Wars has always been about the characters - exploring how their relationships evolve, while facing galactic forces which are happening outside of their control. Few spectacles of screen transcend generations with as much cultural reverberations as Star Wars. To revel in its current incarnation is to return to its roots as an experimental space opera, crafted in the mind of a man who would come to be both revered and despised for following his calling. Spanning the gamut of nearly four decades from the beloved Original Trilogy to the much maligned Prequels, each film stands as a testament to a different time and place in film making. In handing his franchise over to the entertainment juggernaut that is Disney, George Lucas has allowed the ushering in of a new era of wonder in a drastically altered cinematic landscape. Star Wars: The Force Awakens, arriving on Blu-ray and digital this week, is this generation's first step into that larger world, and a stunning achievement in entertainment. Borrowing from the old and setting events in motion for the new, the film itself is a rare delight. From the familiar fanfare of the opening crawl to the stunning cinematography of the final scene, this is a film that gets so much right in satisfying what fans of the franchise have been craving. Director J.J. Abrams, initially a surprise to be chosen as director, applies his masterful signature all over the film. In the opening sequence, we are thrust inside an approaching Storm Trooper transport with a feeling of suspense and anticipation reminiscent of the "shaky cam" style popularized in his 2008 action thriller Cloverfield. He delights in pulling the audience into the film with sweeping cinematic vistas, quickly brought to scale with quick camera zooming techniques as the Millennium Falcon acrobatically screams into the confines of a downed imperial cruiser. It has a magic feeling that Abrams perfects, and it just feels right in the Star Wars universe. Star Wars has always been about the characters - exploring how their relationships evolve, while facing galactic forces which are happening outside of their control. Our first introductions to the characters who will shape the new Star Wars trilogy, come in the form of a rolling spherical droid dubbed BB-8. Inquisitive and loyal, BB-8 charms the audience much as his counterpart R2-D2 did decades ago. This Blu Ray release includes a 6 minute featurette dedicated to bringing this truly revolutionary character to life on the screen. BB-8 is owned by Poe Dameron, a commander in the Resistance's Starfighter Corps and one of Leia Organa's most-trusted operatives. Played by Oscar Isaac, the quick witted pilot evokes a combination of both a younger Han Solo and Luke Skywalker. Seeking to find Skywalker, who we learn from the opening crawl is missing, Poe hides a piece of a map in BB-8 as his village comes under attack from the dreaded First Order. Evoking as much power and dread as the introduction of audiences to the iconic Darth Vader, the dark side manifests itself now through Kylo Ren, who wastes no time in making his presence known to Poe. He, too, is looking for Skywalker and without the map that is now safely hidden in the droid, he takes Poe prisoner and annihilates what is left of the village. Temperamental, young, and strong with the darkside of the force, Ren is masterfully portrayed by Adam Driver. His lineage is important to the story, and while there is no "I am your father" moment, the emotional weight with which his family destiny plays out is as important to the saga as that breathtaking reveal. A disenchanted Storm Trooper, who will affectionately become known as Finn, helps Poe escape the clutches of Kylo Ren. Becoming quick friends and allies, their escape leads them back to try and recover BB-8 and the map. Meanwhile, BB-8 has found himself in the company of a young female scavenger. BB-8 seems to sense something in this girl, who reveals nothing about herself except her name, Rey (Daisy Ridely), and that her presence on the planet is "classified" just like BB-8 beeps to her about his status. Finn and Rey meet up with BB-8 in tow and their intergalactic adventure begins. Along the way, they team up with the legendary Han Solo and Chewbacca, roles, of course, reprised by the magnificent Harrison Ford and Peter Mayhew. Their introduction draws cheers, and their ultimate role in the saga will leave you breathless. Returning briefly are Princess Leia (Now General Organa - reprised by Carrie Fisher) and Luke Skywalker (Mark Hamill), who everyone is looking for. Their story, likely, has already been told, but they are setup to have even larger roles in the sequel trilogy going forward. on when Disney takes over the franchise and setting up the initial script read with the stars, and is everything you hoped it would be. We're then treated to many secrets of the filming and an amazing treatment of the thought process behind all of the characters in the film. We finally learn how the fate of Han Solo was brought about and its a thrill to watch. There are several shorter, but nonetheless interesting, features including The Story Awakens: The Table Read, Crafting Creatures, Building BB-8, Blueprint of a Battle: The Snow Fight , ILM: The Visual Magic of the Force,John Williams: The Seventh Symphony, and Force for Change - a look at charitable work conceived of while filming. Another treat is the deleted scenes segment, which serve to flesh out characters and expand on the already gripping story. The most interesting of all may be the deleted scene of Kylo Ren boarding the Millennium Falcon and sensing Han Solo's presence. With so many talented amateur film editors out there, it won't be long until we see a spliced-in complete version of the film including the deleted scenes. The picture quality and sound both deserve praise. Interestingly, the "3D" version of the film has been left out, but there is no doubt more versions of this Blu-ray on the way. If you can appreciate the film without the 3D aspect, there is no reason not to pick up this incarnation to complete your collection. A fantastic film, which explores the past of the franchise and sets up the future, Star Wars The Force Awakens resets the tone of the franchise and brings it back to the feel of the original trilogy. Its emotional, exciting, familiar and fresh. It will awaken your senses and leave you wanting more which, thankfully, this blu-ray release provides. 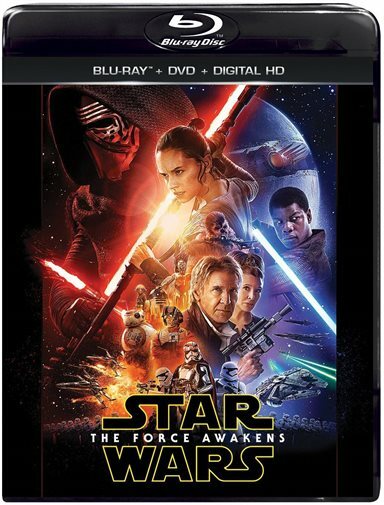 Download Star Wars: Episode VII - The Force Awakens from the iTunes Store in Digial HD.